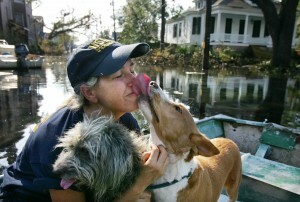 How did Katrina change how we evacuate pets from disaster? It’s estimated that thousands of people refused to evacuate New Orleans in advance of Hurricane Katrina for one reason: they weren’t willing to leave their dogs or cats behind. At the time, most State and Federal rescue organizations had no formal policy on evacuating animals during disasters, and so many people in need of help were faced with a harrowing choice: they could be saved, but only if they left their animals behind. According to Science editor David Grimm, the fact that many people died in the floods because they wouldn’t leave their animals behind — as well as the sight of hundreds of abandoned cats and dogs after the flood waters receded — prompted major changes to state and federal laws regarding the evacuation of pets during disasters. Inspired by Grimm’s reporting for BuzzFeed, and in his book “Citizen Canine,” the NewsHour’s William Brangham and Justin Scuiletti tell the story of those who lived through the storm.